Belgium Belgium U-Pick farms: Find a pick your own farm near you in Belgium for fruit, vegetables, pumpkins, organic foods,local produce and more! 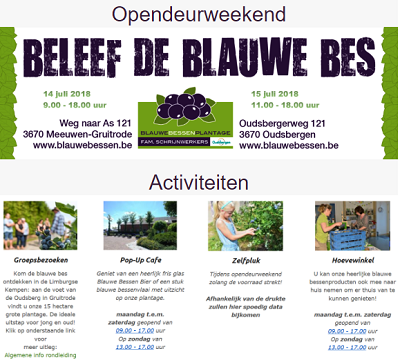 Looking for a local, pick-your-own farm in Belgium? Scroll down this page and you will see the U-Pick farms in Belgium, sorted by county. Those that offer organic or sustainably grown produce are identified by the words "organic" and/or "sustainable" in Green, next to their name (see "What does Organic mean?"). The U-pick crops they offer follow the name of the farm. To search the page for a specific crop, use Ctrl-F (or on an ipad or Mac, use their "search on this page" function) If they have a website, the name will be in blue and underlined; click on it and it will open their website. Since 2002, I've continued to make updates daily (each farm as changes are reported, or I find them). See the customer and farmer menus at the top menu bar to submit updates and corrections and help me keep each current and add any I've missed! Belgium has its share of greenhouses, but there are also fields with berries for Zelfpluktuin or pick-your -own. Fam. Carpenters, Road to As 121, 3670 Meeuwen-Gruitrode, Belgium. Phone: 32 (0) 89 85 89 33. Email: [email protected]. Open: one weekend each July; Self-picking During open house weekend as long as supplies last! we will open our doors to the general public. You get a look behind the scenes of this unique cultivation. Schomstraat 147, Koersel 3582, Belgium +32 11 42 52 75. Email: [email protected]. Open: typically in July. Wij houden van groen en koesteren de natuur en alle cadeaus die zij ons geeft. Vanuit die gedachte maken wij producten die goed zijn voor lichaam en geest. Click here for a link to our Facebook page. Valkenweg 115, Overijse 3090, Belgium. Phone: 32 475 93 05 38. Open: May and June. ;Before coming, don't forget to check if they are open and have berries to pick. Parking is free but unsupervised. they don't have toilet facilities, please take it into account before coming. Small trays and racks are available at the entrance. You may npot bring food nor pets into the fields. Your children are under your sole responsibility within the fields.Click here for a link to our Facebook page. Driekoningenstraat 36a, B-8710 Wielsbeke, Belgium. Phone: 32 (0)56 61 61 61. Email: [email protected]. Open: De zelfpluk in 2018 loopt van maandag 2 juli tot en met zaterdag 8 september. .Onze zelfpluktuin is in de zomer open van maandag tot zaterdag, doorlopend van 10u tot 18u. Je kan bij ons terecht om heerlijke verse bessen te plukken, die bovendien biologisch geteeld worden.Bij ons zijn er ook enkele picknicktafels voorzien, dus je kan gerust je zelf meegebrachte picknick opeten. Je kan ook een sorbet, roomijsje of frisco eten, die wij zelf ambachtelijk maken. In onze winkel verkopen we ook allerlei producten gemaakt van onze bessen. Neerhoek 7, 8720 Oeselgem, Belgium. Phone: 09 388 37 74. Email: [email protected]. Open: starting in late June,from 9 am to 7 pm on Monday, Wednesday, Friday and Saturday.